Goodbye to the Ogden LDS Temple aka the Birthday Cake with Moroni on top. The LDS Church has been all a-twitter about plans to renovate the retro—and arguably ridiculous-looking—structure that sits in the heart of Ogden’s downtown, where it is one of the busiest temples in the world. For some 38 years, the temple has been an unmistakable landmark in a city that has been less than successful in the revitalization arena. 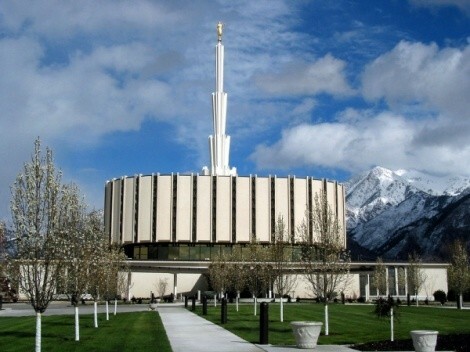 The temple’s feathered spire gained its own gold-leafed fiberglass Moroni in 2001, but alas, weather took its toll on the temple, which has been called an experiment in low-cost construction. So, up will sprout a more traditional temple and, Ogden hopes, a big wedding draw for the city. Is it just coincidence or does former Rep. Craig Frank really seem to be palling around with the chair of Utah Legislature’s redistricting committee? In a recent Facebook post, he notes that he’s just back from Colorado with Rep. Ken Sumsion, R-American Fork, who’s in charge of the redistricting committee. Frank lost his legislative seat when it was discovered that he didn’t live in the district he served. Blogger-momma Holly Richardson was selected to replace him, and she will have to run for the seat in 2012 after redistricting. It’s a big unknown whether Richardson would face off with Frank. During the stunningly swift reaction to charges of racism at Alta High School, you have to hand it to the mother of the teen offender to try to turn this into a teaching moment. Her son reportedly wore a KKK-knock-off to a spirit assembly, thinking it was all a good joke. “When he came home and said what it looked like, we were like, ‘Oh my gosh, I cannot believe [it]. Let’s sit down and talk about this.’ We opened our dialogue and said this is why these hate symbols are so hurtful,” she told KSL News. Other news stations interviewed students, who insisted no harm was meant. So, what makes it funny, then? Racism is about power over a group perceived as somehow inferior to another. Serious stuff and not exactly good satire.